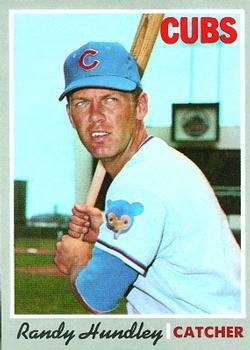 Despite having a lifetime .236 batting average, Randy Hundley is one of the most beloved Chicago Cubs of all time. The Virginia native played 10 seasons with the Cubs in the 1960s and 1970s and was considered a leader on the field for the team that endured a historic collapse in 1969. Hundley also introduced the one-handed catching style, a technique that Hall of Famer Johnny Bench and other catchers soon copied. Upon retiring after the 1977 season and managing 3 1/2 years in the minor leagues, he established baseball fantasy camps for adults. To this day, he operates the Randy Hundley Fantasy Camp in January at the Cubs spring training complex in Mesa, Ariz.
Randy started drawing the attention of professional baseball scouts between his sophomore and junior years of high school. One afternoon in the middle of February during his junior year, San Francisco Giant scout Tim Murchison came to see him at school. After graduating from high school in June 1960, Randy signed a contract with the Giants and received a $110,000 bonus payable over five years. Under the two-year-old oral agreement, Randy also was to receive not less than $1,000 a month during the baseball season because he and his father figured it might take him at least five years to get to the major leagues.13 The Cubs also had been watching him play in high school, but lost interest when they signed bonus baby Danny Murphy, a 17-year-old outfielder from Massachusetts. Randy made his professional baseball debut with Salem in the Class D Appalachian League after turning 18. He spent the next two seasons with Fresno, the Giants’ Class C affiliate in the California League. Despite batting .239 with Fresno in 1962, he was promoted the next season to El Paso in the Double A Texas League where he hit .325 with 23 homers and 81 RBI as a 21-year-old. In the process, he helped El Paso set a Texas League record for most home runs by a team in one season.14 He also made the Texas League All-Star team and led the league’s catchers in fielding. The Giants had a surplus of catchers at the time so Randy was optioned to the Minnesota Twins for one year. The Twins sent him to their International League team in Atlanta, Georgia, which lost 93 out of 148 games that season. Nevertheless, he made his major-league debut against the Cubs on September 27, 1964, at Wrigley Field as a pinch-runner for Duke Snider in the top of the seventh inning of the Giants’ 4-2 loss. He split the 1965 season between Tacoma, the Giants’ Triple A affiliate in the Pacific Coast League, and San Francisco. When the Giants’ regular catcher Tom Haller was injured, Randy was inserted into the lineup and faced Los Angeles Dodger aces Sandy Koufax and Don Drysdale the first two nights. On December 2, 1965, Randy and pitcher Bill Hands were traded to the Cubs for pitcher Lindy McDaniel and outfielder Don Landrum–one of the better trades in Cubs’ history. When Leo “The Lip” Durocher took over the Cubs’ managerial duties in 1966, he claimed the Cubs weren’t an eighth-place team–their finish in 1965. Durocher was right! Even though the North Siders finished in tenth place in 1966, Randy had a banner rookie season, catching 149 games to set a National League record for most games caught by a rookie, leading NL catchers in assists and finishing third among catchers in homers. On May 19, 1966, he doubled, tripled, and stole home in a 7-1 win over the Houston Astros. A month later, he hit his first major-league grand slam off of Drysdale. He also hit for the cycle in a 9-8 win over the Astros in 11 innings on August 11, 1966. He was named to the All-Star rookie team as a result of his accomplishments. As the first half of the ’67 season ended, sports writer Jerome Holtzman said Randy should get the club’s MVP honor. Holtzman cited the catcher’s .300-plus batting average and noted that Randy had caught every inning of 78 straight games. In 1968, Randy caught a major-league-record 160 games, which may help explain his unusually low .226 batting average that season. His best day at the plate in 1968 occurred during a July 28 doubleheader when he drove in three runs in the opener and doubled in the only run of Game Two of the Cubs’ sweep over the Dodgers–8-3 and 1-0–before 42,261 fans. For Randy and other Cub mainstays such as Ernie Banks, Santo and Williams, the 1969 season was the highlight and lowlight of their time in Chicago. On August 14, the Cubs enjoyed a nine- game lead over the St. Louis Cardinals and a 10-game cushion over the New York Mets after being in first place for 155 straight days. But the lead had shrunk to a half-game in early September when the Mets beat the Cubs twice in New York. Randy was in the middle of a game-deciding play in the 3-2 loss in the first game. With the Mets’ Tommie Agee on second base in the sixth inning, Wayne Garrett lined a single to Cubs’ right fielder Jim Hickman, whose throw to home appeared to beat Agee. But rookie umpire Dave Davidson called Agee safe for the third and deciding run. With that, Randy exploded and jumped into the air several times. It only got worse for the Cubs when they lost twice to the Philadelphia Phillies, while the Mets rolled over the Montreal Expos four times, putting the upstart New Yorkers in first place for good. Like most of the other Cub regulars, Randy’s performance at the plate declined greatly in September. On June 1, he was hitting .307 with eight homers, but he hit only .151 in the last month of the season. Nevertheless, the ironman catcher was named to the National League All-Star team for the first time and led the league’s catchers in fewest errors and double plays turned by a catcher and tied for most games and assists. He also hit a grand slam and a double on May 28, 1969, in a 9-8 win over the Giants. During 1966-69, Randy caught a remarkable 612 of his team’s 647 games. During his career, he caught both ends of a doubleheader 55 times. As the 1970 season opened, Durocher announced Randy would be dropped to the eighth spot in the batting order after batting sixth much of the time. A chip fracture on his left thumb sustained in a spring training game against the Oakland A’s caused him to miss the first week of the season. It got worse for “The Rebel” when he tore the cartilage in his left knee during a collision with the Cardinals’ Carl Taylor at home plate on April 21. He missed 89 games in another disappointing season for Cub fans. However, the Cubs had a .612 winning percentage when Randy played. Randy came back in 1972 to play in 114 games and catch rookie Burt Hooton’s no-hitter against the Phillies on April 16 and Milt Pappas’ no-hitter against the San Diego Padres on September 2. He was home recovering from a severed tendon in a toe when Ken Holtzman no-hit the Braves on August 19, 1969, before 37,514 fans at Wrigley Field. He also led the league’s catchers with a .995 fielding percentage and hit a grand slam off the Giants’ Don Carrithers on June 20. Although Hundley played in 124 games and doubled his home run total the next season, his inability to throw out base runners was noticeable. Randy played in only 32 games for the Twins in 1974 as the result of damaging the cartilage in his right knee when he was pushed to the ground by Twins’ pitcher Ray Corbin during an argument at home plate on June 20. Due to the nagging injury, he did not play from July 7 until he caught three innings of a game at Boston on August 18. After he consulted a Chicago doctor, he underwent surgery in September 1974 to repair the cartilage damage in his right knee. On October 25, 1974, he was taken off the Twins’40-man roster. On April 3, 1975, the Padres signed Randy as a free agent after inviting him in February to spring training. He played in 74 games that season and was credited early in the campaign with the improvement in the Padres’ pitching staff.30 A year later, the Padres released the veteran catcher and offered him a job as a player-coach with Hawaii in the Pacific Coast League, but he declined. However, on April 13, 1976, the Cubs signed Randy for his second stint with the franchise. Entering the lineup on the second day of the season, Randy started the winning rally with a double to right center off Mets’ reliever Bob Apodaca in the seventh inning of a 6-5 victory before 9,307 spectators. After reaching second, he looked down and prayed. But the injury bug struck Randy again when he sustained a cervical sprain and a stretched muscle in his left shoulder during an altercation between the Cubs and Giants in San Francisco on May 1 of that year. After being placed on the 15-day disabled list, he underwent surgery to remove a disc and fuse two connecting vertebrae in his neck on June 7, 1976, at Northwestern Memorial Hospital in Chicago. As a result, Randy played in only 13 games that season. In December 1976, new Cubs’ manager Herman Franks named Randy as the club’s bullpen coach and emergency catcher. In two games that season, the Bruins’ former No. 1 catcher went hitless in four at-bats. He was released by the Cubs for the final time on October 12, 1977. After a year as a major-league coach, Randy managed the Cubs’ rookie league team in Bradenton, Florida. In 1979, he was promoted to manager of the club’s Double A affiliate in Midland, Texas. During his two years in Midland, his team won one division title and almost won another. Randy was one step away from managing in the major leagues when he took over the Cubs’ Triple A affiliate in Des Moines, Iowa, in 1981. However, the Iowa Oaks got off to a 12-30 start and Randy was demoted by Director of Player Personnel C.V. Davis on June 1, 1981, which was Randy’s 39th birthday. Instead of going back to Sarasota in the Florida State League, Randy returned home to Chicago to weigh his options. Ironically, Randy was replaced by former Toronto Blue Jays’ manager Roy Hartsfield, who had a 16-32 record at the time as skipper of Midland in the Texas League. Although the Oaks were 11 games out of first place when Randy was demoted, Hartsfield’s Midland team was in last place in the Texas League’s Western Division when the latter was promoted. Fortunately for Randy, his connection to baseball didn’t end in 1981. A year later, he came up with the idea of operating baseball fantasy camps after talking to Chicago restaurant owner Rich Melman. Thirty-five years later, those camps in Mesa, Arizona, are still in business, much to the delight of diehard middle-aged and older Cub fans throughout the country. All campers receive a uniform with their favorite player’s number and hat, get tips from such Cub luminaries as Williams, Fergie Jenkins, Ryne Sandberg, Glenn Beckert, Don Kessinger, Bill Buckner, Jody Davis, Rick Reuschel, Lee Smith and Rick Sutcliffe, and participate in intrasquad games as well as one game against players from another major league team’s fantasy camp. For Randy, the fantasy camps are all about reliving the emotions of a real major league camp. Randy has received several other honors as a result of his Major League Baseball career. He was inducted on July 7, 1992, into the Martinsville-Henry County Professional Wall of Fame along with former Cub teammate J.C. Martin, Carl Hairston, Sonny Wade (football), and David Bailey (motorcross). He is in the Lou Boudreau Hall of Fame sponsored by the Pitch and Hit Club of Chicago, whose mission is “to be a preeminent baseball organization by recognizing and honoring the achievements of those in the baseball community.”40 On April 19, 2017, he and seven other former Cubs received World Series rings in conjunction with the Cubs’ first World Series title in 108 years in 2016. Randy still attends the annual Cubs Convention in Chicago in January. A main cog in the Cubs’ first division teams of the late 1960s and early ‘70s, Randy’s baseball career was curtailed by serious injuries that forced him to retire at age 35. Despite that, he is generally regarded as the second-best catcher in the team’s history behind only Hall of Famer Gabby Hartnett. And to this day, he is giving hundreds of middle-age adults and beyond a taste of what it’s like to attend a major league spring training camp. The author is indebted to Director Pat Ross and the Bassett Historical Center in Bassett, Virginia, for providing several copies of newspaper articles about Randy and material from Bassett High School Yearbooks. This biography was reviewed by Joel Barnhart and fact-checked by Kevin Larkin. 1 “Cecil R. Hundley Sr.,” Martinsville Bulletin, February 3, 1987. 2 Bill Weekes, “Cecil Hundley’s Biggest Baseball Accomplishment Son’s Rise In Majors,” Martinsville Bulletin, June 29, 1969. 3 Bob Vorwald, What It Means To Be A Cub (Chicago: Triumph Books, 2010), 61. 4 Vorwald, What It Means To Be A Cub, 61. 8 John D. Bassett High School Yearbooks, 1959, 1960, from Bassett Historical Center. 9 John D. Bassett High School Yearbook, 1960. 10 Betty Onida Foster Hundley, https:findagrave.com/cgi-bin-/fg.cgi?page=gr&Grid=74678474 (https:findagrave.com/cgi-bin-/fg.cgi?page=gr&Grid=74678474). 11 Fred Mitchell, Cubs: Where Have You Gone? (New York: Sports Publishing, 2004), 114. 13 Hundley, Jr., Petitioner v. Commissioner of Internal Revenue, Respondent. United States Tax Court. 14 Tom Mitchell, “Playing Days Remembered As Ex-Cub Toils As Manager,” Martinsville Bulletin, December 28, 1980. 16 Eddie Gold and Art Ahrens, The New Era Cubs 1941-1985 (Chicago: Bonus Books, 1985), 148. 17 “Native Bassett Big League Baseball Player Rests At Home in Collinsville For Winter,” Henry County Journal, February 8, 1968. 18 David Claerbaut, Durocher’s Cubs The Greatest Team That Didn’t Win (Dallas: Taylor Publishing Company, 2000), 34. 19 Carrie Muskat, Banks to Sandberg to Grace Five Decades of Love and Frustration with the Chicago Cubs (Chicago: Contemporary Books, 2001), 109. 20 Muskat, Banks to Sandberg to Grace Five Decades of Love and Frustration with the Chicago Cubs, 109. 21 Jerome Holtzman, “Hat’s Off!” The Sporting News, July 15, 1967. 22 “Cubs, Braves Tie Mark,” The Sporting News, July 15, 1967. 23 Jerome Holtzman, “Cubs Stagger at Halfway Point As Swatters Fall Into Swoon,” The Sporting News, July 22, 1967. 24 Gold and Ahrens, The New Era Cubs 1941-1985, 150. 25 Vorwald, What It Means To Be A Cub, 63. 26 “Hundley The Answer?” The Sporting News, September 4, 1971. 27 Jerome Holtzman, “An Ump Has Friends, After All,” The Sporting News, September 26, 1970. 28 Gold and Ahrens, The New Era Cubs 1941-1985, 150. 29 Richard Dozer, “Santo, After Long Count, Still in Cub Corner,” The Sporting News, December 22, 1973. 30 Phil Collier, “Padres Gloating: When Bell Rings, Siebert Is Ready,” The Sporting News, May 3, 1975. 31 Richard Dozer, “Old Idol Randy Brings Cub Fans to Life,” The Sporting News, May 1, 1976. 32 “Lost Year For Hundley,” The Sporting News, August 14, 1976. 34 Marc Hansen, “Should Cubs start from scratch?” Des Moines Tribune, June 2, 1981. 35 Gene Raffensperger, “Oaks’ Hundley out in Cubs’ shakeup,” Des Moines Tribune, June 1, 1981. 38 Vorwald, What It Means To Be A Cub, 66. 39 Bob Vorwald, Cubs Forever Memories from the Men Who Lived Them (Chicago: Triumph Books, 2008), 25. 41 “Betty Hundley, 58, wife of former Cub,” Chicago Sun-Times, September 12, 2000. 42 Vorwald, What It Means To Be A Cub, 65.